The famous Chess Pavillion viewed from a neighboring peak. Hua Shan, view from west Peak of a distant mountain top rising from the "Sea of Clouds." 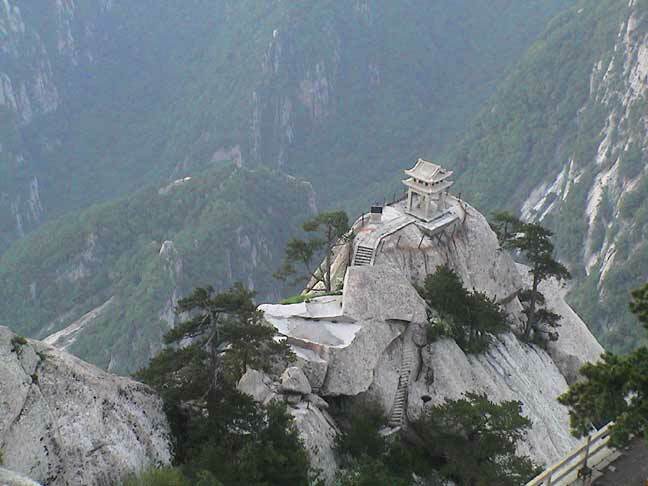 A quiet mountain vista on Hua Shan is a pleasant spot to meditate. Inner court yard of a small secluded temple where we stay. Hua Shan mountain trail of hand carved stone steps. Hua Shan, distant peaks viewed through the clouds. Rebecca Kali, our trip leader enjoys an optional part of our journey, the "Cliff Hanging Path." Our trip leader, Rebecca Kali, takes a quiet moment to meditate in a secluded cave used by Daoist hermits. Rebecca standing near entrance to cave favored by Daoist hermits.